P&G Battery Marketing. Does Duracell’s Quantum Have the Juice to Overtake CopperTop? – StratGo Marketing. Plug-in marketing department services. P&G Battery Marketing. Does Duracell’s Quantum Have the Juice to Overtake CopperTop? Duracell has just launched a new battery. 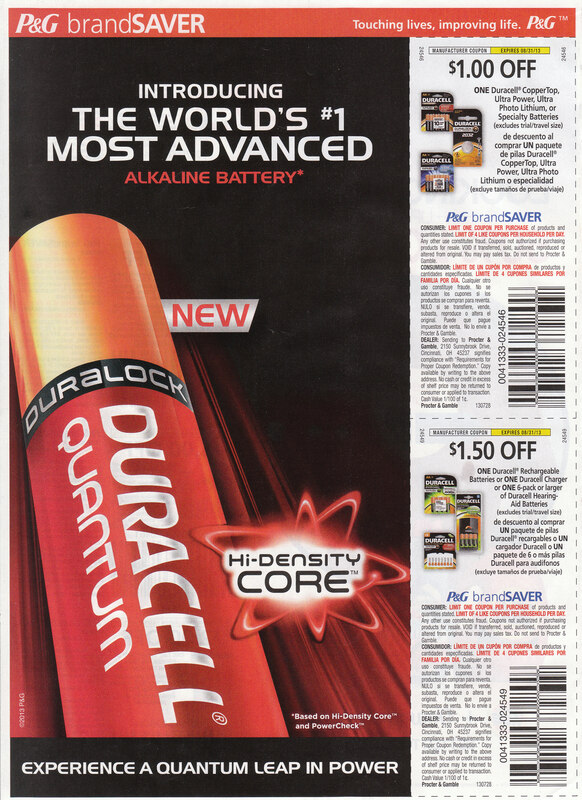 Self-proclaimed as “the world’s most advanced alkaline battery,” please welcome Duracell Quantum. Back in 2009, I wrote about Duracell Smart Power, and why I thought it was a strong brand positioning platform. Judging from the company’s website, it seems that Duracell has abandoned this approach. Innovation continues, though, with a new, red battery. Introducing Duracell Quantum. A revolutionary advancement in battery technology. Combined with a Hi-Density Core™ and PowerCheck™, it’s a Quantum leap in battery power. Only battery with Hi-Density Core™ technology for unbeatable long lasting power. Only battery with PowerCheck™. Instantly check your power level at any time. Get dependable, long-lasting power from CopperTop batteries. These batteries have been engineered to deliver the power you need for all your household devices. Quantum brings news, and perhaps real innovative benefits, but the message seems muddled to me. Basically, the new Quantum is “unbeatable long lasting power” versus Copper Top’s “long-lasting power.” And some undisclosed way to check the battery power level, although the website product photo seems to reveal a built-in indicator. Overall, it’s fair to wonder: can’t they do better than that? First, it’s not particularly easy to compare the two batteries. How about lasts x% longer or some other strong yet simple benefit? And second, why not highlight the power level checkability feature in a standout, visual way? New product innovation and news to the battery market. Technology branding with Hi-Density Core™ (even though its consumer meaning is questionable – sounds like a computer processor). Visual differentiation for the new battery – red versus black. In-house competition. Duracell is competing against itself, a la Gillette (not a surprise as they are both P&G brands). Continuing to feature/leverage first responders in marketing communications. But, at a reported 20% to 30% price premium to CopperTop (Andrew Adam Newman – The New York Times), and only initially available in AA and AAA formats, is there enough reason to switch to the new battery? Why is this new battery really better and worth the extra price? It just feels like something is missing. Photo: Newspaper coupon insert 7/28/2013. And, guess what? The coupons in the Sunday news insert announcing the Quantum launch are not valid toward purchase of the new battery. So much for making trial easier. Here’s the new commercial. Same message: It’s just better – take our word for it. Duracell wants to pump up the battery market with the launch of Quantum, its self-proclaimed longest lasting battery. Is there a meaningful difference versus its flagship CopperTop? Are there enough benefits for consumers to pay more? Microfarads is a measure of capacitance, which is simple electrical charge, or a number of electrons. mAH is a measure of the amount of current, and the amount of time it can be supplied. You could convert that, but I’m not sure why you would want to. For alike batteries, AAs are 1.5V, mAH is a good comparison. There are other things like peak current, which may be of interest to some people with specific applications, but it’s not going to matter to 99% of people buying batteries. The price at Costco is 30% higher for the Quantum over the copper top. According to Consumer’s Report the “Hi-density Core” Quantum is 12% more longevity over the Copper Top. P & G has done it again with their strong brand positioning platform. Does this price increase justify the results? Hi these batteries look great. do you think i can still get some for our small fire hall in rural alberta. Who would I contact. This is an independent marketing and business blog. Contact P&G regarding your question. Good luck. 1. 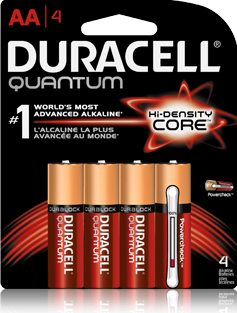 Sales and market share are up for Duracell, aided in part by price promotions, new distribution at Sams Club and the Quantum launch;. Thanks for your comment Vim. Package doesn’t state a milliamp rating. Neither does the battery. Makes the whole deal look bogus. I emailed Duracell requesting these numbers for their AA and AAA Quantum cells, and they stated they will not publish them as mAH is not an accurate comparison. That is bull. I’m now more skeptical than ever about their advantages. Thats because a battery is measured by capacity ask how many micro farads it has. I stll believe mAH is an accurate comparison, and one which other battery types and manufacturers use. Farads or mAH, Duracell does not want to disclose information that enables objective comparisons of their products, and expects people to buy strictly on marketing presentation. – A standard alkaline AA battery holds about 2.8 amp-hours. – That means that a AA battery can produce 2.8 amps for an hour at 1.5 volts (about 4.2 watt-hours — a AA battery can light a 4-watt bulb for a little more than an hour). Let’s call it 1 volt to make the math easier. To store one AA battery’s energy in a capacitor, you would need 3,600 * 2.8 = 10,080 farads to hold it, because an amp-hour is 3,600 amp-seconds.